Abstractables™ is the fast-paced, creative thinking, word guessing game where you try to get your team to correctly guess a word or phrase by arranging and interacting with simple shapes before the time runs out. Do you know what a cow looks like? Of course you do, but can you design one with basic shapes? And get your team to guess it correctly? And do it all in 60 seconds while your teammates are screaming hilariously wrong answers at you? 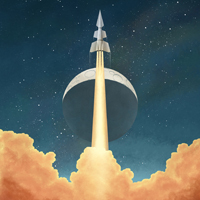 Welcome to ABSTRACTABLES! With 2000 words and phrases from 8 categories, including animals, people, locations, food, sayings, motions, objects and entertainment, the possibilities for fun for the whole family are endless and the replay value incredibly high. You simply roll the die, draw a card, and start moving the pieces. It’s so fun and easy, anyone can play. 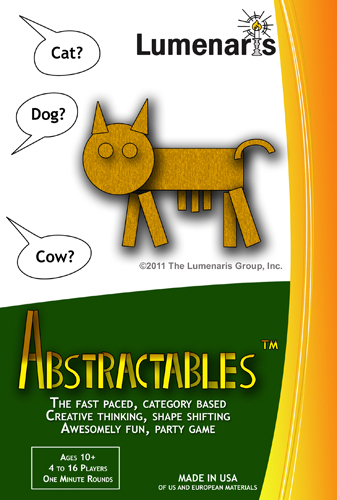 Bring Abstractables to your next family gathering or game night and watch the hilarity ensue! It levels the playing field. Not artistic, don't worry, you don't need to draw anything. Just move the pieces to form the shape to communicate the word or phrase to your team. Abstractables contains 3-layer European Birch hardwood pieces, category cards with over 2000 words or phrases, a one-minute timer, and an 8-sided category die. WARNING: Once you start playing, you may not be able to stop!